Upon exposure to Ag on the day of birth, neonatal mice mount balanced primary Th1 and Th2 responses, with the former displaying upregulated IL-13Rα1 expression. This chain associates with IL-4Rα to form a heteroreceptor (IL-4Rα/IL-13Rα1) that marks the Th1 cells for death by IL-4 produced by Th2 cells during rechallenge with Ag, hence the Th2 bias of murine neonatal immunity. The upregulation of IL-13Rα1 on neonatal Th1 cells was due to the paucity of IL-12 in the neonatal environment. In this study, we show that by day 8 after birth, naive splenic T cells are no longer susceptible to IL-13Rα1 upregulation even when exposed to Ag within the neonatal environment. Furthermore, during the 8-d lapse, the naive splenic T cells spontaneously and progressively upregulate the IL-12Rβ2 chain, perhaps due to colonization by commensals, which induce production of IL-12 by cells of the innate immune system such as dendritic cells. In fact, mature T cells from the thymus, a sterile environment not accessible to microbes, did not upregulate IL-12Rβ2 and were unable to counter IL-13Rα1 upregulation. Finally, the 8-d naive T cells were able to differentiate into Th1 cells even independently of IL-12 but required the cytokine to counter upregulation of IL-13Rα1. Thus, in neonatal mice, IL-12, which accumulates in the environment progressively, uses IL-12Rβ2 to counter IL-13Rα1 expression in addition to promoting Th1 differentiation. For a long time, the neonatal period was considered a window during which exposure to Ag induces T cell tolerance, and rechallenge later with the same Ag leads to unresponsiveness (1). Clonal deletion of T cells was initially considered the main mechanism for neonatal tolerance (2). However, careful examination of secondary neonatal responses revealed the development of immunity, but this was mostly in the form of Th2 rather than Th1 cells (3–7). The excess of Th2 cells in neonates likely confers susceptibility to allergic reactions, whereas the diminished Th1 responses sustain vulnerability to microbial infections (8). Lately, it has been shown that both Th1 and Th2 cells develop in the primary neonatal T cell response (7, 9). However, the Th1 cells displayed upregulation of IL-13Rα1 (9), which was due to diminished IL-12 production by neonatal dendritic cells (DCs) (10). Also, IL-13Rα1 expression on Th1 cells represents a developmental trait as T cells from adult mice do not upregulate IL-13Rα1 when challenged with Ag within the neonatal environment where IL-12 is limited (10). Thus, there is a T cell–intrinsic factor that contributes to the regulation of IL-13Rα1 expression on Th1 cells. In this study, we show that by 8 d of age, the primary Th1 cells lose susceptibility to IL-13Rα1 upregulation and develop secondary responses when rechallenged with Ag. The mechanism underlying the inability of neonatal Th1 cells to upregulate IL-13Rα1 at day 8 lies on a spontaneous upregulation of the IL-12Rβ2 chain on naive T cells prior to differentiation. This, however, occurred only when the naive T cells were derived from the spleen (SP), an organ accessible to microbes, but not from the thymus (THY), a sterile site guarded from environmental microbes by the blood–THY barrier (11). IL-12Rβ2 upregulation on naive SP T cells was gradual and dependent on IL-12, a cytokine produced by innate immune system cells upon activation through TLRs by microbial compounds such as CpG and LPS (12–14). In fact, these TLR-ligands triggered IL-12Rβ2 expression by naive neonatal T cells when injected into 1-d-old mice, and, upon exposure to Ag, these cells did not upregulate IL-13Rα1 but developed secondary responses. Moreover, when naive T cells from 8-d-old mice were exposed to Ag in host mice that were deficient in IL-12, differentiation into Th1 cells occurred but IL-13Rα1 expression persisted, indicating that signaling through IL-12Rβ2, presumably by IL-12, is needed to counter IL-13Rα1 upregulation. Together, these observations suggest that IL-12 produced by innate cells is required not only to drive differentiation of naive T cells toward Th1, but also to counter the upregulation of IL-13Rα1 on these cells, resulting in resistance to IL-4–driven apoptosis during rechallenge with Ag. 129Sv/Pas expressing the GFP under the control of the IL-13Rα1 promoter were generated in our laboratory and previously described (15). These knockin mice were then used to generate IL-13Rα1+/+-GFP BALB/c mice by speed congenic technology. BALB/c mice in which exons 7, 8, and 9 of the IL-13Rα1 locus were deleted and replaced by a neomycin gene were also generated in the laboratory by homologous recombination as described (15). DO11.10/Rag2−/− transgenic BALB/c mice expressing OVA-specific TCRs were previously described (9). IL-12−/− BALB/c mice deficient for IL-12p35 gene (16) were from The Jackson Laboratory. All animals were used according to protocols approved by the University of Missouri animal care and use committee. Chicken OVA 323–339 peptide (SQAVHAAHAEINEAGR) was purchased from Sigma-Aldrich (St. Louis, MO). Ig-OVA, expressing OVA peptide (OVAp) within the V region of the H chain, and Ig-W, the wild-type IgG2b backbone used to generate Ig-OVA, were previously described (9, 10, 17). CpG (ODN 1826) and LPS were purchased from InvivoGen (San Diego, CA). T cell purification and adoptive transfer. SP naive CD4+ T cells were purified from DO11.10/Rag2−/− mice at the indicated age by positive selection on anti-CD4 Ab-coupled magnetic beads (Miltenyi Biotec, Auburn, CA). For purification of THY naive CD4 T cells, the culture was depleted of CD8 T cells (whether single or double positive) on anti-CD8 Ab–coupled microbeads prior to positive selection of CD4 T cells on anti-CD4 microbeads. For transfer into host mice, 1 × 105 purified CD4 T cells were adoptively transferred into 1-d-old hosts by i.v. injection through the facial vein using a 30-gauge needle as described (17). Usually 32–40 mice are used to generate 8 neonatal hosts. Primary or ex vivo responses. Mice recipient of T cell transfer on the day of birth are injected i.p. with a saline solution containing 100 μg Ig-OVA. Two weeks later, the splenic cells containing both T cell and APCs were stimulated for a short 4-h period of time (ex vivo conditions) with 10 μM OVAp to enhance cytokine accumulation and facilitate intracellular detection. CD4 T cells were then isolated on anti-CD4 microbeads, labeled with KJ1-26 Ab, and tested for intracellular production of IFN-γ. Mice recipient of T cell transfer on the day of birth are injected i.p. with a saline solution containing 100 μg Ig-OVA. Two weeks later, the splenic cells (1 × 106 cells/well) containing both T cells and APCs were stimulated with 10 μM OVAp for 24 h instead of 4 h to facilitate cytokine secretion. Production of IFN-γ was determined by ELISPOT and ELISA. Mice recipient of T cell transfer on the day of birth are injected i.p. with a saline solution containing 100 μg Ig-OVA. Two months later, the mice were challenged with 125 μg OVAp in CFA. Ten days later, the SP (1 × 106 cells/well) and lymph node (LN; 5 × 105 cells/well) containing both T cells and APCs were stimulated with 10 μM OVAp for 24 h, and production of IFN-γ was determined by ELISPOT and ELISA. Purified splenic CD4+ T cells were incubated for 20 min at 4°C with 5 μg/ml 2.4G2 mAb to block FcγRs. The cells were stained with FITC-labeled KJ1-26, PE-Cy7–labeled anti-CD4, allophycocyanin-labeled anti-CD62L (BD Biosciences), and PE-labeled anti–IL-12Rβ2 (R&D Systems) for 30 min at 4°C. The culture was then washed with staining buffer, and detection of IL-12Rβ2 expression was carried out by flow cytometry using a Beckman Coulter Cy An (Beckman Coulter, Brea, CA). Quadrants in density plots are drawn relative to isotype controls. The data were analyzed using FlowJo version 8.8.6 (Tree Star). Detection of apoptosis by staining with Annexin V.
Apoptosis of primary Th1 cells was measured by Annexin V binding to KJ1-26+IFN-γ+ T cells as was previously described (9, 10). The cells were first incubated with the clonotypic mAb KJ1-26 and Annexin V (BD Biosciences) as described for cell-surface staining, and cytokine secretion was blocked by 10 μg/ml BFA. The cells were then fixed with 2% formaldehyde, permeabilized with 2% saponin, and incubated with anti–IFN-γ Ab. Quadrants in dot plots are drawn relative to isotype controls. The data were collected and analyzed as described for cell-surface staining. IL-13Rα1–GFP mice were used as a source of naive CD4 T cells for transfer into host mice. For detection of IL-13Rα1 expression on primary Th1 cells in host mice, the cells were stained with KJ1-26, anti-CD4, and anti–IFN-γ Abs, and the KJ1-26+CD4+IFN-γ+ T cells were analyzed for GFP expression by flow cytometry. Splenic cells containing both T cells and APCs were incubated with Ag in 96-well round-bottom plates for 24 h. IFN-γ production was measured by ELISA using anti-cytokine Abs according to the manufacturer’s instructions. Detection of IFN-γ by ELISPOT was carried out as described (5). Briefly, HA-multiscreen plates (Millipore, Bedford, MA) were coated with capture Ab, and free sites were saturated with DMEM culture media containing 10% FCS. Subsequently, 1 × 106 splenic cells were added, and the culture was stimulated with OVAp with or without blocking Ab. Biotinylated anti–IFN-γ Ab (1μg/ml) was added, and bound Ab was revealed with avidin-peroxidase. Spots were counted using Immunospot software (Cellular Technology, Cleveland, OH). Injection of rIL-12 (PeproTech, Rocky Hill, NJ) into IL-12−/− mice consisted of 100 ng cytokine in PBS given i.p. on the day of birth. Neutralization of IL-12 in vivo. For neutralization of IL-12 in vivo, the mice were given i.p. 50 μg anti–IL-12 Ab (clone C17.8; BD Biosciences) or control rat IgG on days 6, 7, and 8 after birth. Treatment with LPS and CpG. One-day-old DO11.10/Rag2−/− mice were injected i.p. with 10 μg LPS or 20 μg CpG in PBS. RT and DNA amplification were performed on a StepOne Instrument cycler (Applied Biosystems) using Power SYBR Green RNA-to-CT 1-Step Kit (Applied Biosystems) according to the manufacturer’s instructions on naive CD4 T cells. The forward and reverse primers were: 5′-AGTCCGTGTTACTGCCATCAACGA-3′ and 5′-TGTACCTCTGCTCCCAGAAGCATT-3′, respectively. The results were analyzed by the comparative threshold cycle method using the StepOne software (Applied Biosystems). β-actin was included as a normalizer. Upon exposure to Ag, naive neonatal T cells differentiate into Th1 and Th2 cells (7), but the former upregulate IL-13Rα1 expression (9, 10). In contrast, when naive T cells from adult mice are transferred into newborns and exposed to Ag, they differentiate into Th1 cells that do not upregulate IL-13Rα1 (9). This suggests that the susceptibility to upregulation of IL-13Rα1 represents a developmental trait that subsides over time. To determine the point in time at which the naive T cells are no longer susceptible to IL-13Rα1 upregulation, newborn mice were adoptively transferred with naive DO11.10 TCR-transgenic T cells from 1- to 10-d-old mice, and IL-13Rα1 expression was analyzed after exposure to OVAp. Because IL-13Rα1, along with IL-4Rα, serves as a death heteroreceptor for Th1 cells to bias secondary neonatal responses toward Th2 cells (9, 10), we began by defining the time point at which exposure to Ag overcomes the Th2 bias and restores Th1 secondary immunity. 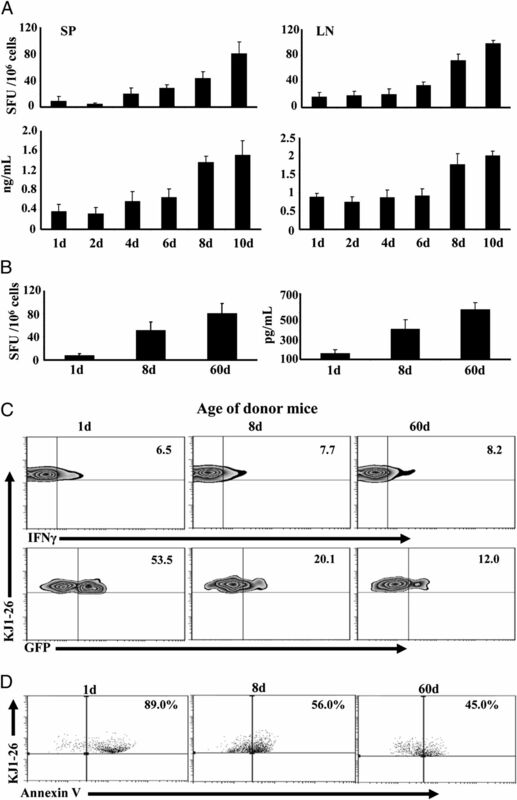 The results show that hosts recipient of neonatal DO11.10 T cells from 1-, 2-, 4-, or 6-d-old mice had minimal secondary IFN-γ (Th1) responses in the SP and LN as measured by ELISA and ELISPOT (Fig. 1A). In contrast, those transferred with T cells from 8- or 10-d-old mice had increased IFN-γ responses (Fig. 1A). Consistent with these results, the recall IFN-γ responses were also significant when the transfer was made with T cells from 8-d, but not 1-d-old, mice (Fig. 1B). Moreover, although all hosts had similar percentages of primary Th1 cells, IL-13Rα1 expression on these Th1 cells was significantly lower in mice recipient of naive T cells from 8-d- (20.1%) or 60-d-old (12.0%) mice versus those transferred with naive T cells from 1-d-old mice (53.5%) (Fig. 1C). This indicates that naive T cells from 8-d-old mice are less susceptible to IL-13Rα1 upregulation than naive T cells from 1-d-old mice. When the cultures (comprising APCs, Th1, and Th2 primary cells) were stimulated with OVAp and death of Th1 cells was measured, there was significant apoptosis (89%) of Th1 cells in the hosts recipient of naive T cells from 1-d-old mice (Fig. 1D), most likely due to IL-4 from Th2 cells triggering their death through the IL-4Rα/IL-13Rα1 heteroreceptor (9). However, apoptosis was lower in hosts recipient of naive T cells from 8-d or 60-d-old mice (Fig. 1D), likely due to the diminished IL-13Rα1 expression on primary Th1 cells (Fig.1C). These findings indicate that day 8 after birth represents a transitional time point in which naive T cells are no longer susceptible to Ag-induced IL-13Rα1 upregulation and become able to develop Th1 recall and secondary responses. At day 8 after birth, naive CD4 T cells lose susceptibility to IL-13Rα1 upregulation. Newborn (1-d-old) BALB/c mice were given 1 × 105 naive CD4 T cells from 1 to 10-d-old DO11.10 (A, B) or IL-13Rα1–GFP DO11.10 (C, D) mice, and the hosts were injected with 100 μg Ig-OVA. (A) Hosts were challenged with OVAp in CFA at 60 d of age, and their SP and LN secondary IFN-γ responses were analyzed by both ELISPOT and ELISA. (B–D) The SP cells were harvested on day 14 after exposure to Ig-OVA, and in vitro recall IFN-γ responses were analyzed by both ELISPOT and ELISA (B). Each bar represents the mean ± SD of triplicate wells. (C) The SP cells were stained for TCROVA (with KJ1-26 Ab), CD4, and intracellular IFN-γ after a rapid stimulation with OVAp (ex vivo conditions). The KJ1-26+ CD4+ T cells were analyzed for IFN-γ production (top panel), and those cells positive for KJ1-26, CD4, and IFN-γ (KJ1-26+CD4+ IFN-γ+) were assessed for TCROVA (KJ1-26) and GFP (IL-13Rα1) expression (bottom panel). (D) The SP cells were stimulated with OVAp for 24 h (to allow for IL-4 secretion by Th2 cells) and stained for TCROVA, CD4, intracellular IFN-γ, and Annexin V. The KJ1-26+CD4+ IFN-γ+ cells were analyzed for Annexin V binding. Quadrants in dot and density plots are drawn relative to isotype controls. This experiment was repeated three times with four mice each. SFU, Spot-forming units. Spontaneous and gradual upregulation of IL-12R on naive T cells may serve as a compensatory mechanism to counter upregulation of IL-13Rα1 expression under limited IL-12 conditions. To test this premise, naive CD4 T cells were harvested from neonates at different time points after birth and analyzed for expression of the inducible IL-12Rβ2 chain (β1 is constitutively expressed) (18). The results show that IL-12Rβ2 expression on CD62L+ (naive) T cells reached a significant level between 8 and 10 d after birth relative to naive T cells from adult mice (60 d old) (Fig. 2A). Indeed, the level of IL-12Rβ2 expression on naive T cells from 1–6-d-old mice represents only 0.5–5% relative to T cells from 60-d-old mice. In contrast, naive T cells from 8–10-d-old mice had 48–64% IL-12Rβ2 expression relative to T cells from adult mice. These IL-12Rβ2 levels on 8 d naive T cells, although small relative to Ag-stimulated Th1 cells (97.5% stained positive for IL-12Rβ2), they are significant because they represent half the levels observed with naive T cells from 60-d-old mice, which do not upregulate IL-13Rα1 upon exposure to Ag even under limited IL-12 conditions. Similar results were observed at the mRNA level as naive T cells from 8-d-old mice, like those from adult mice, had a significant mRNA increase relative to T cells from younger animals (Fig. 2B). These results indicate that spontaneous upregulation of IL-12Rβ2 expression reaches an optimal level by day 8 of age. This likely compensates for limited IL-12 to counter IL-13Rα1 upregulation, confers resistance to apoptosis, and sustains development of recall and secondary Th1 responses. To test this premise, we needed to first determine the amount of IL-12 that could upregulate IL-12Rβ2 on 1-d-old naive T cells to the level found on the 8 d T cells. Accordingly, the cells were incubated with various concentrations of rIL-12 and IL-12Rβ2 expression was analyzed. As shown in Fig. 2C, 1 ng of rIL-12 is needed to induce IL-12Rβ2 expression that is comparable to levels observed on naive CD4 T cells from 8-d-old mice. Subsequently, when naive CD4 T cells from 1-d-old mice were incubated with 1 ng rIL-12 and stimulated with anti-CD3 and anti-CD28, they had diminished IL-13Rα1 expression relative to those stimulated in the absence of rIL-12 (Fig. 2D). These findings indicate that by day 8 of age spontaneous upregulation of IL-12Rβ2 expression reaches an optimal level able to counter upregulation of IL-13Rα1 during Ag stimulation. Increase in IL-12Rβ2 chain expression on naive CD4 T cells occurs spontaneously and reaches a transitional level by day 8 after birth. Naive CD4 T cells were purified from DO11.10 mice at different time points after birth and assessed for IL-12Rβ2 expression at the protein (A) and mRNA (B) level by flow cytometry and real-time PCR, respectively. (A) The Zebra plots show IL-12Rβ2 protein and CD62L expression on KJ1-26+CD4+ T cells. For comparison purposes, IL-12Rβ2 expression was analyzed on CD4+CD11c−IFN-γ+ differentiated neonatal Th1 cells. (B) The bars represent the mean ± SD fold mRNA increase from three experiments based on the comparative threshold cycle. (C) Naive CD4 T cells were isolated from 1-d-old DO11.10 mice and incubated with graded amounts of rIL-12 for 24 h. The cells were then stained with KJ1-26, anti-CD4, anti-CD62L, and anti–IL-12Rβ2 Abs. The percentages of IL-12Rβ2+CD62L+ among total KJ1-26+-CD4+ T cells are indicated in the upper right corner of each quadrant. (D) Naive CD4 T cells from 1-d-old IL-13Rα1-GFP reporter mice were stimulated with anti-CD3 (10 μg/ml) and anti-CD28 (1 μg/ml) for 5 d in the absence or presence of 1 ng/ml IL-12 and stained for CD4, CD11c, and intracellular IFN-γ. The CD4+CD11c−IFN-γ+ Th1 cells were analyzed for IL-13Rα1 expression by GFP. Because naive T cells from 8-d-old mice transferred into 1-d-old hosts are able to develop into primary Th1 cells that resist apoptosis and develop secondary responses upon re-exposure to Ag, it is likely that IL-12Rβ2 countered the upregulation of IL-13Rα1 and nullified the formation of the IL-4Rα/IL-13Rα1 death heteroreceptor. To further define the contribution of IL-12Rβ2 to the control of IL-13Rα1 expression, we first needed to determine the minimal amount of IL-12 that drives differentiation of Th1 cells from adult mice. Fig. 3A shows that as little as 0.1 ng of IL-12 can drive optimal differentiation of naive T cells into Th1 cells. We then used this concentration of IL-12, along with naive neonatal T cells from 1–6-d-old mice, to ascertain the contribution of IL-12Rβ2 to the control of IL-13Rα1 expression during differentiation from naive to Th1 phenotype. The results show that with the minimum IL-12, IL-12Rβ2 upregulation occurs at all time points (Fig. 3B), but only the T cells from 6-d-old mice, which had 10.1% IL-12Rβ2, were able to counter upregulation of IL-13Rα1 (Fig. 3C). Together these results indicate that the minimal IL-12 is able to drive differentiation, but optimal levels of IL-12Rβ2 expression are required to counter IL-13Rα1 upregulation. Developmental increase in IL-12Rβ2 expression on naive T cells is required for counterregulation of IL-13Rα1 during differentiation into Th1 cells. (A) Purified naive CD4 T cells from adult IL-13Rα1+/+ mice were stimulated with anti-CD3 (10 μg/ml), anti-CD28 (1 μg/ml), and graded amounts of rIL-12 for 5 d. Cells were then tested for differentiation by measuring intracellular IFN-γ or IL-4 control. Zebra plots show intracellular cytokine staining on CD4+CD11c− gated cells. Cells that were not given rIL-12 were included for control purposes. (B) Naive CD4 T cells from 1-, 2-, 4-, and 6-d-old IL-13Rα1+/+ mice were cultured with or without 0.1 ng/ml rIL-12 for 24 h, and the naive CD4+CD62L+CD11c− cells were analyzed for IL-12Rβ2 expression. (C) Naive CD4 T cells from 1-, 2-, 4-, and 6-d-old IL-13Rα1+/+-GFP mice were stimulated with anti-CD3 and anti-CD28 Abs in the absence or presence of 0.1 ng/ml rIL-12, and the differentiated CD4+CD11c−IFN-γ+ Th1 cells were analyzed for IL-13Rα1 expression by GFP. Cells that were not given rIL-12 were used for control purposes. This is representative of at least five experiments. The fact that CD4 T cells gradually upregulate IL-12Rβ2 expression over time in the absence of any immunization suggests an association with progressive neonatal colonization by commensals and symbiotic organisms. Because IL-12Rβ2 is inducible, rather than constitutively expressed on the cells, it is logical to envision an involvement of environmental IL-12 produced by innate immune cells as a consequence of interaction with commensals (19, 20). To test this premise, we began by analyzing the dependence of spontaneous IL-12Rβ2 expression on environmental IL-12. Accordingly, naive T cells from IL-12−/− mice were harvested on days 1, 8, and 60 after birth, and IL-12Rβ2 expression was compared with naive T cells from IL-12+/+ mice. As indicated in Fig. 4A, naive CD4 T cells from IL-12−/− mice of all ages had minimal IL-12Rβ2 expression, whereas those from IL-12+/+ mice had a gradual increase in receptor expression that reached a maximum level by 60 d of age. Given that commensals trigger the production of IL-12 by DCs (19), it is possible that the spontaneous expression of IL-12Rβ2 over time is related to a progressive increase in environmental IL-12 due to colonization by commensals (21). To test this premise, we mimicked the effects of commensals (which are noninfectious) by injecting 1-d-old mice with the major bacterial compounds LPS and CpG and analyzed IL-12Rβ2 expression on CD62L+ naive CD4 T cells. Fig. 4B shows that IL-12+/+ mice recipient of LPS or CpG had an increased expression of IL-12Rβ2 on their naive T cells, whereas those from IL-12−/− mice remained at a basal level. 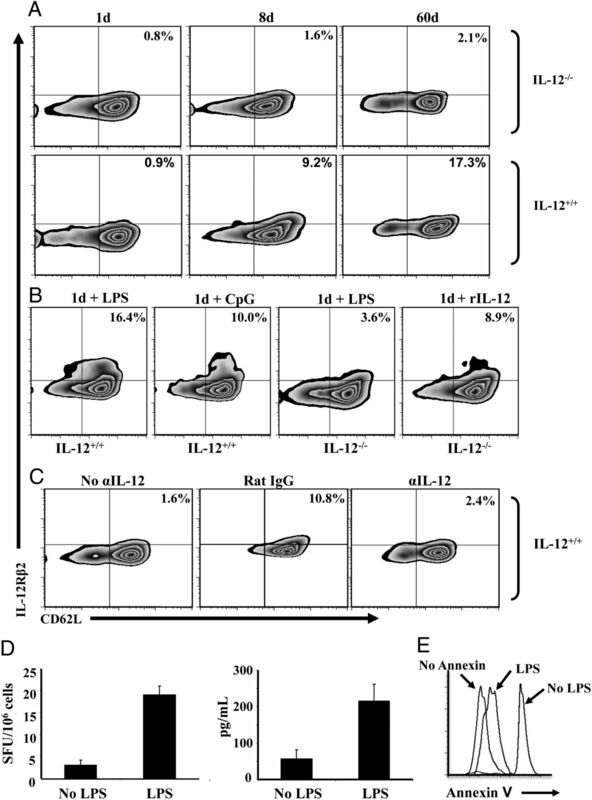 The upregulation of IL-12Rβ2 in the IL-12+/+ mice is related to environmental IL-12 because exogenous IL-12 given to the deficient mice triggers IL-12Rβ2 upregulation on the naive T cells. Furthermore, neutralization of environmental IL-12 by injection of anti–IL-12 Ab beginning at day 6 after birth suppresses the upregulation of IL-12Rβ2, and the naive T cells had minimal receptor expression on day 8 that was much lower than mice recipient of rat IgG isotype control (Fig. 4C). In fact, only 2.4% receptor expression was observed, which is comparable to the level usually seen on day 6 before injection of IL-12. The 1-d-old naive T cells that were induced to upregulate IL-12Rβ2 by LPS were able to overcome apoptosis and develop IFN-γ recall responses like naive T cells that upregulated the receptor spontaneously over a period of 8 d (Fig. 4D, 4E). Indeed, when naive CD4 T cells isolated from 1-d-old LPS-treated mice were transferred to 1-d-old BALB/c mice, and the hosts were exposed to Ig-OVA, their SP T cells were able to develop IFN-γ responses 2 wk later upon recall with OVAp in vitro (Fig. 4D) and did not undergo apoptosis (Fig. 4E). Transfer of naive CD4 T cells that were not exposed to LPS did not yield IFN-γ responses. Upregulation of IL-12Rβ2 expression on naive T cells is dependent upon the availability of environmental IL-12. (A) Naive CD4 T cells were isolated from both IL-12+/+ and IL-12−/− BALB/c mice on days 1 (1d), 8 (8d), or 60 (60d) after birth and analyzed for IL-12Rβ2 expression by flow cytometry. The plots show IL-12Rβ2 protein expression on CD3+CD4+CD62L+ naive T cells. (B) IL-12+/+ and IL-12−/− BALB/c newborn mice (three to five per group depending on the litter) were given on the day of birth 10 μg LPS, 20 μg CpG, or 100 ng rIL-12. Twenty-four hours later, the CD4 T cells were purified and analyzed for IL-12Rβ2 expression. The plots show IL-12Rβ2 protein expression on CD3+CD4+CD62L+ naive T cells. (C) DO11.10 mice were given an injection of 50 μg anti–IL-12 Ab or control rat IgG on days 6, 7, and 8 after birth, and the naive CD4 T cells were purified and assessed for IL-12Rβ2 expression 24 h after the last injection. A group of mice that was not given any injection (No αIL-12) was sacrificed on day 6 and included for control purposes. The plots show IL-12Rβ2 protein expression on KJ1-26+CD4+CD62L+ naive T cells. (D) Naive CD4 T cells isolated from LPS-treated (LPS) or untreated (No LPS) DO11.10 newborns were transferred (105 cells/mouse) into 1-d-old BALB/c mice, and the hosts were given 100 μg Ig-OVA. Two weeks later, the SP cells (106 cells/well) were stimulated with 10 μM OVAp in vitro, and IFN-γ production was measured by ELISPOT (left panel) and ELISA (right panel). Each bar represents the mean ± SD of triplicate wells. (E) The SP cells were also analyzed for apoptosis by Annexin V binding upon stimulation with OVAp. The histograms show Annexin V binding to cells gated on CD4+KJ1-26+IFN-γ+. SFU, Spot-forming units. Furthermore, only LPS-experienced T cells had reduced Annexin V binding upon exposure to Ig-OVA, indicating resistance to apoptosis (Fig. 4D, right panel). Overall, these results indicate that upregulation of the IL-12Rβ2 chain on naive CD4 T cells reaches optimal levels on day 8 after birth, most likely due to progressive colonization by commensals and the consequent accumulation of environmental IL-12. The lapse of time after birth required for accumulation of environmental IL-12 and upregulation of IL-12Rβ2 expression on naive CD4 T cells may be related to the gradual nature of colonization by commensals. If this indeed is the case, naive T cells that originate from a sterile environment will not display significant IL-12Rβ2 expression even after an extended time lapse. To test this premise, we analyzed IL-12Rβ2 expression by mature naive T cells from the THY, a sterile environment in which the blood–THY barrier prevents accessibility to microbes (11), and compared the findings with T cells from the SP, a nonsterile environment that is accessible to microbes and their products. Indeed, naive CD4 T cells purified from the THY 8 d after birth did not upregulate the IL-12Rβ2 chain as compared with CD4 T cells from the SP of the same mice (Fig. 5A). Even when CD4 T cells were purified from the THY of 60-d-old mice, IL-12Rβ2 expression remained insignificant like thymic and splenic CD4 T cells from 1-d-old mice. Interestingly, when the thymic CD4 T cells from 8-d-old mice were transferred into BALB/c mice and exposed to Ig-OVA, they gave rise to Th1 cells that displayed upregulation of IL-13Rα1 expression, whereas the splenic counterparts did not (Fig. 5C). Furthermore, these Th1 cells displayed increased apoptosis upon recall with OVAp, whereas the splenic counterparts lost susceptibility to apoptosis (Fig. 5B). In fact, even thymic T cells from 60-d-old mice had increased apoptosis like the control thymic and splenic cells from 1-d-old mice, indicating that the thymic environment remains sterile, perhaps throughout the life span of the mouse. The upregulation of IL-13Rα1 and the consequent apoptosis resulted in a lack of IFN-γ recall responses when the naive CD4 T cells originated from the THY (Fig. 5D, 5E). However, when the donor CD4 T cells were from the SP of 8- or 60-d-old mice, those IFN-γ responses were restored. 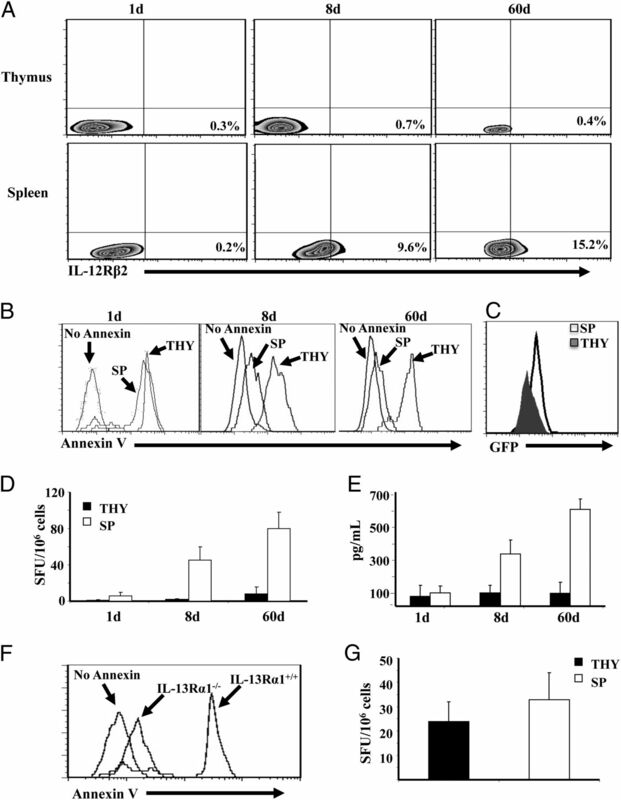 Annexin V binding by the Th1 cells emanating from the transfer of thymocytes, and their inability to develop IFN-γ response is due to IL-13Rα1 upregulation rather than spontaneous apoptosis because transfer of naive CD4 T cells from the THY of 1-d-old IL-13Rα1−/− mice did not lead to elevated Annexin V (Fig. 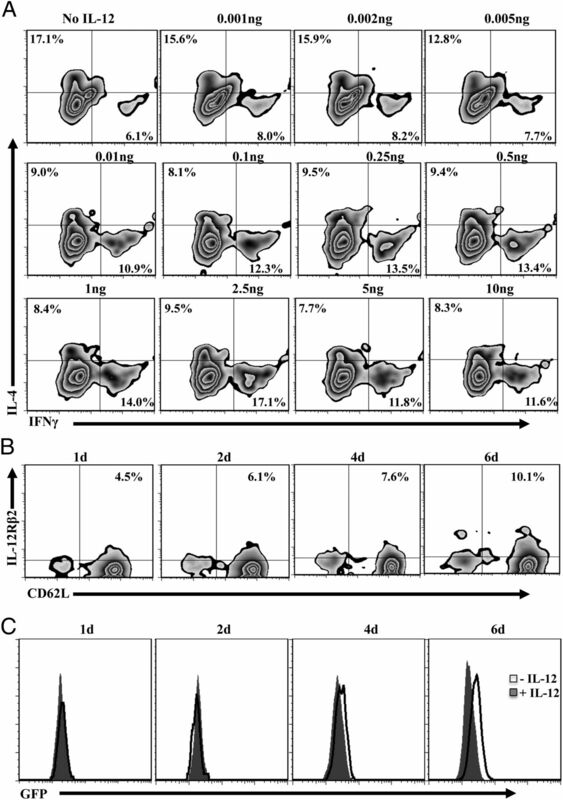 5F), and the Th1 cells were able to develop recall IFN-γ responses equivalent to Th1 cells emanating from the transfer of splenic naive CD4 T cells from IL-13Rα1−/− mice (Fig. 5G). Together, these results indicate that a sterile environment nonpermissive to microbes and their products does not support IL-12Rβ2 upregulation on naive CD4 T cells, leading to the inability of these cells to counter IL-13Rα1 upregulation during differentiation into Th1 cells. SP but not THY naive CD4 T cells from 8-d-old mice upregulate IL-12Rβ2 expression and develop recall Th1 responses upon re-exposure to Ag. (A) Naive CD4 T cells were purified from the SP and THY of DO11.10 mice on days 1 (1d), 8 (8d), and 60 (60d) after birth and assessed for IL-12Rβ2 expression by flow cytometry. The plots show IL-12Rβ2 expression on KJ1-26+CD4+CD62L+ cells. (B–D) Purified SP and THY CD4 T cells from 1-, 8-, and 60-d-old IL-13Rα1-GFP DO11.10 mice were transferred (105 cells/mouse) into 1-d-old BALB/c mice, and the hosts were given 100 μg Ig-OVA. Two weeks later, the SP cells (1× 106 cells/well) were stimulated with 10 μM OVAp in vitro and analyzed for Annexin V binding (B), IL-13Rα1 expression (C), and IFN-γ production by both ELISPOT (D) and ELISA (E). The histograms show Annexin V binding (B) and GFP expression (C) by cells gated on CD4+KJ1-26+IFN-γ+. (D and E) Bars represent the mean ± SD of triplicate wells. (F and G) Purified SP and THY CD4 T cells from 1 d DO11.10 IL-13Rα1−/− or IL-13Rα1+/+ control mice were transferred (105 cells per mouse) into 1-d-old BALB/c newborns, and the hosts were given 100 μg Ig-OVA. Annexin V binding (F) and recall IFN-γ responses (G) were measured by ELISPOT as described in (B) and (D). SFU, Spot-forming units. Thus far, we have found that neonatal T cells from 8-d-old mice express an optimal level of IL-12Rβ2, which is able to counter upregulation of IL-13Rα1. The time lapse for IL-12Rβ2 expression is likely due to gradual colonization by commensals, which trigger IL-12 production by cells of the innate immune system, and progressive accumulation of the cytokine in the neonatal environment. We have previously shown that restimulation of primary neonatal Th1 cells with Ag leads to apoptosis of the cells, but addition of IL-12 to the culture nullifies cell death (9, 10). Because Th1 cells usually have abundant IL-12R (IL-12Rβ1/B2) (22), it is possible that the cytokine (IL-12) signals through the IL-12R to counteract the function of IL-13Rα1. In light of these observations, it is possible that upon optimal expression of IL-12Rβ2, naive T cells are able to differentiate into Th1 cells but require IL-12 to signal through the IL-12R to counter upregulation of IL-13Rα1. To test this premise, CD4 T cells were purified from 8-d-old DO11.10/Rag2−/− mice and transferred to a 1-d-old IL-12−/− BALB/c host and assessed for IFN-γ production and IL-13Rα1 expression. Indeed, CD4 T cells transferred into IL-12−/− BALB/c hosts were able to differentiate into Th1 cells, though to a lesser extent than those transferred into IL-12+/+ BALB/c recipients (Fig. 6A). However, the Th1 cells were unable to counteract IL-13Rα1 upregulation as compared with those transferred into IL-12+/+ hosts (Fig. 6B). Furthermore, these cells displayed increased Annexin V binding upon recall with OVAp (Fig. 6C). Consistent with these results, the recall IFN-γ responses were decreased when the transfer was made with T cells from 8-d-old mice into IL-12−/− hosts as compared with their IL-12+/+ counterparts (Fig. 6D, 6E). IL-12Rβ2 on naive T cells from 8-d-old mice is functional because it drives phosphorylation of STAT4 upon incubation with IL-12 cytokine without any Ag stimulation (Fig. 6F). Together, these results indicate that naive T cells expressing optimal IL-12Rβ2 are able to differentiate into Th1 cells in an IL-12–independent manner, but require the cytokine to counter upregulation of IL-13Rα1 expression. Naive T cells expressing optimal IL-12Rβ2 differentiate into Th1 cells but require IL-12 cytokine to counteract IL-13Rα1 upregulation. (A) Newborn (1-d-old) IL-12−/− and IL-12+/+ control BALB/c mice were given 1 × 105 naive CD4 T cells from 8 d DO11.10 IL-13Rα1-GFP reporter mice, and the hosts were injected with 100 μg Ig-OVA. SP cells were harvested 14 d after transfer and stained for surface TCROVA (with KJ1-26 Ab), CD4, and intracellular IFN-γ after a rapid stimulation with OVAp (ex vivo conditions). The KJ1-26+CD4+ T cells were analyzed for intracellular IFN-γ production. The bars represent the percent IFN-γ+ among KJ1-26+CD4+ double-positive cells. (B) Those cells positive for IFN-γ (KJ1-26+CD4+ IFN-γ+) were assessed for IL-13Rα1 expression by GFP. (C) The SP cells were stimulated with OVAp for 24 h and stained for TCROVA, CD4, intracellular IFN-γ, and Annexin V, and the KJ1-26+CD4+IFN-γ+ cells were analyzed for Annexin V binding. SP cells stimulated with OVAp were analyzed for IFN-γ production by both ELISPOT (D) and ELISA (E). Each bar represents the mean ± SD of triplicate wells. This experiment was repeated three times. (F) Naive CD4 T cells (1 × 104 cells/well) were purified from 8-d-old DO11.10 mice and incubated with 2.5 ng rIL-12 for the indicated time points. Cells were then lysed, and p-STAT4 levels were analyzed by Western blot. β-actin levels were also analyzed for control purposes. SFU, Spot-forming units. In recent years, it has become clear that cells of the innate immune system, particularly DCs, play a major role in the outcome of T cell immunity in the newborn (10, 23, 24). Even maturation of DCs dictates the time during which Ag exposure leads to balanced immunity in neonates (10, 25). In contrast, if naive T cells from adult mice are placed in the neonatal environment, the innate cells no longer restrict immunity (9), suggesting that factors intrinsic to the T cell contribute to the balance of immunity in the newborn. This study examined this issue and shows that by day 8 after birth, naive T cells are no longer susceptible to upregulation of IL-13Rα1 mRNA or protein. Indeed, naive T cells taken from neonates of different ages and primed with Ag in 1-d-old newborns develop functional Th1 cells alongside Th2 cells and are devoid of IL-13Rα1 expression only when the donor is 8 d of age or older. These Th1 cells were in fact able to resist IL-4-mediated apoptosis and develop secondary responses that were otherwise absent in animals recipients of naive T cells from donors >8 d of age. The question that begs for an answer then is what happens during the first 8 d of life for naive T cells to acquire resistance to upregulation of IL-13Rα1 during Ag stimulation and differentiation to Th1 cells? It is well known that upregulation of IL-12Rβ2 during Ag stimulation programs naive T cells to differentiate into Th1 cells (22). This is likely mediated by IL-12 produced by the cells presenting Ag to the T cells. Given that naive T cells from 8-d-old mice are able to differentiate within the neonatal environment, which contains very little IL-12, and develop secondary responses without undergoing apoptosis, we suspected that IL-12Rβ2 provides a compensatory mechanism to counter upregulation of IL-13Rα1 expression. This was indeed the case, as IL-12Rβ2 expression on naive T cells underwent progressive upregulation over time and by day 8 reached an optimal level that was able to counter IL-13Rα1 upregulation under low neonatal levels of IL-12. In fact, T cells from mice >8 d of age had lower levels of IL-12Rβ2, and even at day 6, exogenous IL-12 was required to counter IL-13Rα1 upregulation (Fig. 3). Also, the upregulation of IL-12Rβ2 on naive T cells seems to be dependent on environmental IL-12 because 8-d-old T cells from IL-12–deficient mice had lower IL-12Rβ2 expression and were unable to resist apoptosis or develop recall responses. The finding that Th1 cells from neonatal mice express high levels of IL-12Rβ2, like those from adult mice, suggest that the reduced IL-12 in the neonatal environment is able to stimulate upregulation of IL-12Rβ2 but is not sufficient to counter IL-13Rα1 upregulation during differentiation. IL-12Rβ2 upregulation on naive T cells serves as a compensatory mechanism to overcome IL-13Rα1 upregulation. Moreover, the progressive upregulation of IL-12Rβ2 on naive T cells can be explained by the lapse of time required for optimal accumulation of IL-12 in the environment. IL-12 is produced by cells of the innate immune system upon stimulation with TLR ligands (12, 13). However, the 8-d-old mice from which the T cells were harvested were naive animals maintained under specific pathogen-free barrier conditions, and the accumulation of IL-12 needed for IL-12Rβ2 expression may be related to progressive colonization by commensals (19, 20). This may provide TLR ligation, leading to IL-12 production (21). The experiments with thymic CD4 T cells provide support to this postulate, as the THY is a privileged site that is inaccessible to microbes. In fact, naive T cells from the THY of 8- or even 60-d-old mice had low levels of IL-12Rβ2 despite optimal upregulation of the chain by their splenic counterparts. The cells were not able to counter upregulation of IL-13Rα1, prevent apoptosis, or support recall of primary Th1 responses. The observation that thymocytes from IL-13Rα1–deficient mice resist apoptosis and produce IFN-γ upon stimulation with Ag under limited IL-12 emphasizes the compensatory mechanism of IL-12Rβ2 in the counterregulation of IL-13Rα1. The findings also indicate that IL-12 needs to signal through the upregulated and functional IL-12Rβ2 to counter IL-13Rα1 upregulation. This conclusion is drawn from the observation that the naive T cells expressing optimal IL-12Rβ2 were able to differentiate into Th1 cells upon transfer into IL-12−/− hosts but could not counter IL-13Rα1 expression. The differentiation into Th1 cells in the absence of IL-12 may be related to an IL-12–-independent mechanism, as was observed previously (26–28). In contrast, the IL-12 signaling through IL-12Rβ2 to counter IL-13Rα1 expression and nullify apoptosis may provide an explanation as to the rescue of neonatal secondary Th1 responses by IL-12 (5). 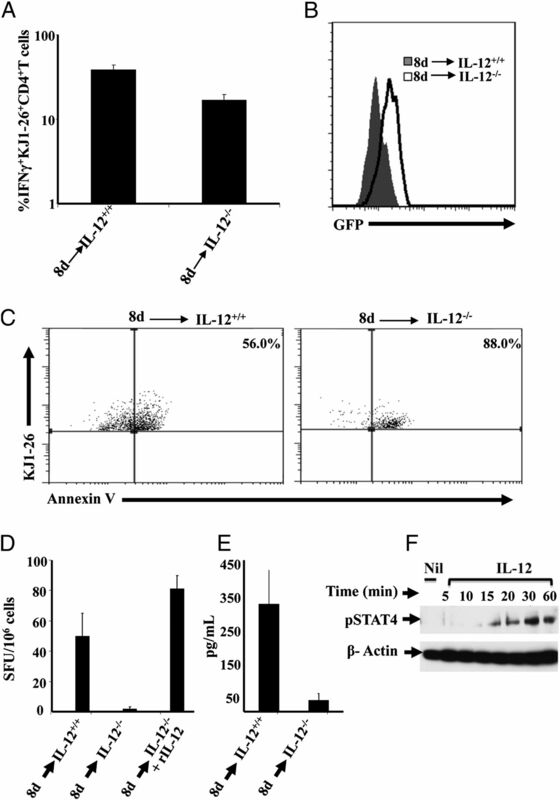 Overall, the findings provide insights as to how IL-12 and its receptor IL-12Rβ2 function to connect cells of the innate and adaptive immune system and shape neonatal immunity. In this regard, neonatal DCs produce little IL-12, which is sufficient to drive differentiation of Th1 cells but not enough to counter upregulation of IL-13Rα1 on these lymphocytes. However, over time, the DCs are exposed to environmental stimuli, including commensals, and produce more IL-12 cytokine, leading to upregulation of IL-12Rβ2 on naive neonatal T cells. This serves to provide a compensatory mechanism by which the naive T cells refrain from upregulation of IL-13Rα1 during priming with Ag. Ultimately, IL-4Rα/IL-13Rα1 formation is limited, and the Th1 cells will not undergo apoptosis upon rechallenge with Ag even when Th2 cells are producing excessive IL-4 cytokine. This work was supported by Grants RO1AI048541 and R21HD060089 (to H.Z.) from the National Institutes of Health. J.A.C. was supported by a Life Sciences Fellowship from the University of Missouri. C.M.H. was supported by Training Grant GM008396 from the National Institute of General Medical Sciences.
. 1953. Actively acquired tolerance of foreign cells. Nature 172: 603–606.
. 1986. Neonatal T-cell tolerance to minimal immunogenic peptides is caused by clonal inactivation. Nature 319: 413–415.
. 1990. Neonatal tolerance induction by class II alloantigens activates IL-4-secreting, tolerogen-responsive T cells. J. Immunol. 144: 854–859.
. 1998. Neonatal exposure to a self-peptide-immunoglobulin chimera circumvents the use of adjuvant and confers resistance to autoimmune disease by a novel mechanism involving interleukin 4 lymph node deviation and interferon gamma-mediated splenic anergy. J. Exp. Med. 188: 2007–2017.
. 1998. Newborn mice develop balanced Th1/Th2 primary effector responses in vivo but are biased to Th2 secondary responses. J. Immunol. 160: 4217–4224.
. 1992. Intrathymic islet cell transplantation reduces beta-cell autoimmunity and prevents diabetes in NOD/Lt mice. Diabetes 41: 1672–1676.
. 2010. Release of IL-12 by dendritic cells activated by TLR ligation is dependent on MyD88 signaling, whereas TRIF signaling is indispensable for TLR synergy. J. Leukoc. Biol. 88: 189–199.
. 2010. Acquisition of adult-like TLR4 and TLR9 responses during the first year of life. PLoS ONE 5: e10407.
. 2012. Bone marrow-derived IL-13Rα1-positive thymic progenitors are restricted to the myeloid lineage. J. Immunol. 188: 3208–3216.
. 1996. Genetically resistant mice lacking interleukin-12 are susceptible to infection with Leishmania major and mount a polarized Th2 cell response. Eur. J. Immunol. 26: 1553–1559.
. 2001. Neonatal immunity develops in a transgenic TCR transfer model and reveals a requirement for elevated cell input to achieve organ-specific responses. J. Immunol. 167: 2585–2594.
. 1998. The interleukin-12/interleukin-12-receptor system: role in normal and pathologic immune responses. Annu. Rev. Immunol. 16: 495–521.
. 2003. Constitutive p40 promoter activation and IL-23 production in the terminal ileum mediated by dendritic cells. J. Clin. Invest. 112: 693–706.
. 2010. Developmental biology of gut-probiotic interaction. Gut Microbes 1: 186–195.
. 2002. Lactobacilli differentially modulate expression of cytokines and maturation surface markers in murine dendritic cells. J. Immunol. 168: 171–178.
. 1997. Regulation of the interleukin (IL)-12R beta 2 subunit expression in developing T helper 1 (Th1) and Th2 cells. J. Exp. Med. 185: 817–824. 2007. Innate immunity of the newborn: basic mechanisms and clinical correlates. Nat. Rev. Immunol. 7: 379–390.
. 2010. Overcoming dendritic cell tardiness to triumph over IL-13 receptor: a strategy for the development of effective pediatric vaccines. Discov. Med. 9: 554–559.
. 2003. Either IL-2 or IL-12 is sufficient to direct Th1 differentiation by nonobese diabetic T cells. J. Immunol. 170: 735–740.
. 2005. A role for IL-27 in early regulation of Th1 differentiation. J. Immunol. 175: 2191–2200.
. 2007. CD8- DCs induce IL-12-independent Th1 differentiation through Delta 4 Notch-like ligand in response to bacterial LPS. J. Exp. Med. 204: 1525–1531.